Olympus is a fantasy role-playing game that allows players to immerse themselves in the wondrous time of Ancient Greek history and myth. Players can rise through the ranks of the citizenry, honing their skills by competing in athletic events; then put those skills to the test as they face challenges from the gods. Olympus enhances the typical role-playing experience by getting the player off the couch. Through the use of a unique combination of input devices, the virtual actions of your avatar in the game world are driven by the players corresponding physical actions in the real world. Players succeed in Olympus only through perseverance, sweat, and calories burned! Unlike other exergames that are about exercise, Olympus is about the experience of playing the game. To play the game, the player must be physically active. James Gee describes “stealth learning” as “when the learners are so caught up in their goals that they don’t realize they are learning.” Olympus is about “stealth exercise”. The player is so engaged in the experience of the game, they do not realize they are burning calories and getting an effective workout. The game is being developed as part of a research project currently in progress in the Games for Entertainment and Learning Lab at Michigan State University and partially funded by the Robert Wood Johnson Foundation through the Health Games Research initiative. The research is led by MSU Professors Wei Peng, Brian Winn, and Karin Pfeiffer. First, existing hardware and technology used in commercial-off-the-shelf exergames (i.e., dancepad, Wii remote, nunchuk) will be innovatively adopted and converted as input devices for users to interact with PC-based games. Testing of this concept will provide evidence for commercial game developers to consider supporting these “active” input devices besides the traditional “passive” controller in their games so that more games available on the market can be played actively using actual human movements. Second, Olympus is about “stealth exercise”. The player is so engaged in the experience of the game, they do not realize they are burning calories and getting an effective workout. Third, based on the self-determination theory, this study will advance our understanding of the game play experience and prescribe guidelines to design exergames more effectively by examining how the game features increase competence, autonomy, and relatedness which are the three main components of motivation. We will also investigate how these three components mediate the relationship of playing exergames and the dependent variables. Fourth, a lab experiment will be conducted to test what game features work better to motivate players psychologically and have actual physiological outcomes (i.e., greater energy expenditure). Fifth, a 12-week study will compare the exergame-based intervention with a a more traditional passive version of the game to provide evidence for the long-term effectiveness of this type of exergame. The outcome measures include both self-reported psychological variables as well as objective measures of energy expenditure and weight loss. 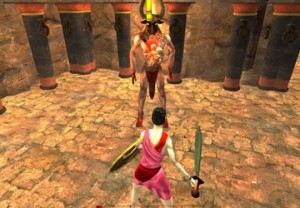 The Olympus game has been exhibited, presented about, and is the subject of scholarly research publications. Peng, W., Pfeiffer, K., Winn, B., Lin, J., Suton, D. (2015). A pilot randomized, controlled trial of an active video game physical activity intervention. Health Psychology, Vol 34(Suppl), Dec 2015, 1229-1239. Peng, W., Pfeiffer, K. A., & Winn, B. (2014). An exploratory study of the impact of contextual cues of violence in an active video game. Games for Health Journal, 3(2), 67-71. Peng, W., Lin, J-H., Pfeiffer, K. A., & Winn, B. (2012). Need satisfaction supportive game features as motivational determinants: An experimental study of a self-determination theory guided exergame.Media Psychology, 15(2), 175-196. Winn, B., Peng, W., Pfeiffer, K. (2011, September). Stealth exercise, blatant fun: Crafting an exergame that players intrinsically want to play. Presented at the Digital Games Research Association (DIGRA) 2011 Conference. Hilversum, The Netherlands. September 15, 2011. Hertzmann, M., Suton, D., Pfeiffer, K. A., Peng, W., Winn, B., & Lin, J-H. (2011, October). Energy cost of playing Olympus-the new exergame to promote physical activity in young adults. Poster presented at the annual meeting of the Midwest Chapter of the American College of Sports Medicine, Indianapolis, IN, October 28, 2011. Winn, B. Olympus. Exhibited at DemoCamp Lansing, Michigan Historical Museum, December 2011, Lansing, MI. Winn, B. The Design of Olympus. International Game Developers Association (IGDA) Michigan Chapter Meeting. September 22, 2011.